As with any new CEO, Microsoft's Satya Nadella will have a packed agenda that includes filling top management roles and re-examining strategy. The tech giant on Tuesday named Nadella to replace Steve Ballmer. 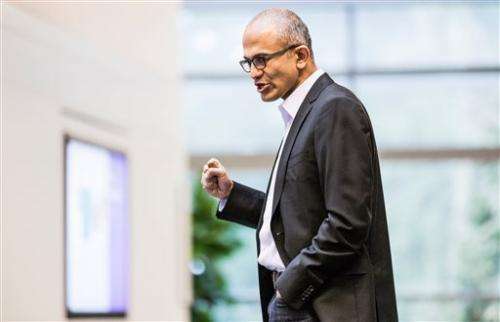 He is only the third chief executive in Microsoft's 38-year history. The longtime insider will be tasked with catching rivals in the mobile devices arena and offering more software and services over the Internet. — Integrate Nokia's mobile device business. Microsoft's $7.3 billion acquisition will add roughly 30,000 employees to Microsoft's existing 100,000 workers—barring some likely layoffs. Nokia, the largest maker of phones that run Microsoft's Windows Phone software, was also believed to be working on a phone that uses Google's Android operating system prior to the acquisition. It's unclear whether Microsoft will cancel the effort in time for the industry conference where Nokia was expected to show off the phone, Mobile World Congress, which starts Feb. 24. — Fix Windows and unite the company's various operating systems. Windows 8 and the Windows 8.1 upgrade have not revived the PC market as expected. That's mainly because keyboard- and mouse-users have found it difficult to navigate the touch-first "modern" interface which uses large tiles. Analysts expect Microsoft to merge its Windows Phone and Windows RT operating system for lightweight tablets into one system to appease software developers and consumers alike, while restoring some familiar navigation tools to the computer-based version of Windows. Look for announcements at the Mobile World Congress or Microsoft's own developers' conference, Build, which starts April 2. — Set a hardware strategy. Microsoft's Surface tablets have been losing money despite increased sales; the newly released Xbox One is expected to be unprofitable until game sales begin to make up for costly hardware; and Nokia's phone shipments plunged in the latest quarter. Turning these units into healthy profit centers —or getting rid of them— will be one of the many decisions Nadella faces. — Pick a management team. Microsoft passed over many internal candidates in favor of Nadella, including former Skype head Tony Bates and Chief Operating Officer Kevin Turner. How Nadella works with them will give an indication of the company's direction going forward. — Work with the board, including Bill Gates. Nadella asked Microsoft's founder to increase his involvement in the company's products and technology, meaning Gates will relinquish the chairmanship to John Thompson. How Nadella balances his own vision with Gates' could be a challenge. As well, investment fund ValueAct Capital is set to appoint its president, G. Mason Morfit, to Microsoft's board at the company's first quarterly meeting this year. While ValueAct is a booster of the very cloud-computing and enterprise software businesses that Nadella helped to build, the new CEO's relationship with the board and its latest large investor will be important.